Not exactly round: We’ll see how it works in heavy traffic. Please check the update concerning the south bypass and Highway 34 at the bottom of this story. Only it’s not really round, at least not round like a circle. It’s more like an “ovalabout.” The city’s contractor built that new intersection layout at Quarry and Spring Hill in anticipation of closing North Albany Road for reconstruction starting in June. There probably isn’t enough room to make it completely round, so it ended up the way it did. The point is to allow traffic to flow through the intersection without stopping when there is no cross traffic. North Albany commuters will see how it works when the time comes. Approaching Ellsworth Bridge on 20: Backup in the mirror. In the meantime, the Corvallis bypass project seems to be putting more Albany-bound traffic on Highway 20. 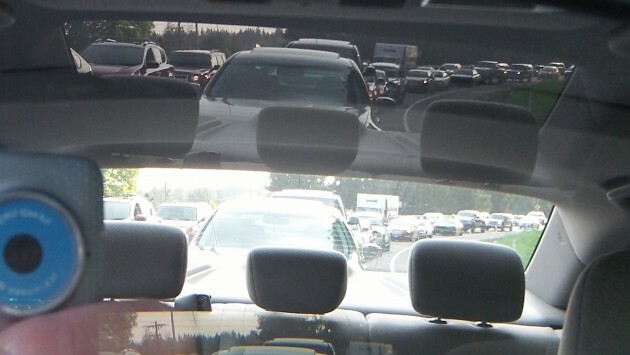 Writing in the Corvallis paper, reporter Bennett Hall Tuesday quoted Rick Little, the ODOT spokesman for this area, as recommending various alternatives for avoiding the congestion on Highway 34, including taking Highway 20 if people are headed to Albany and Lebanon. That would explain the heavy traffic and backup approaching the Ellsworth Street Bridge, seemingly more severe than usual during the afternoon drive time. The work on the south bypass is to provide two right-turn lanes onto Highway 34, and it’s supposed to be completed in June. In Albany, the Public Works Department has taken special pains — especially on social media including Facebook — to keep the public informed on progress in the North Albany road project. 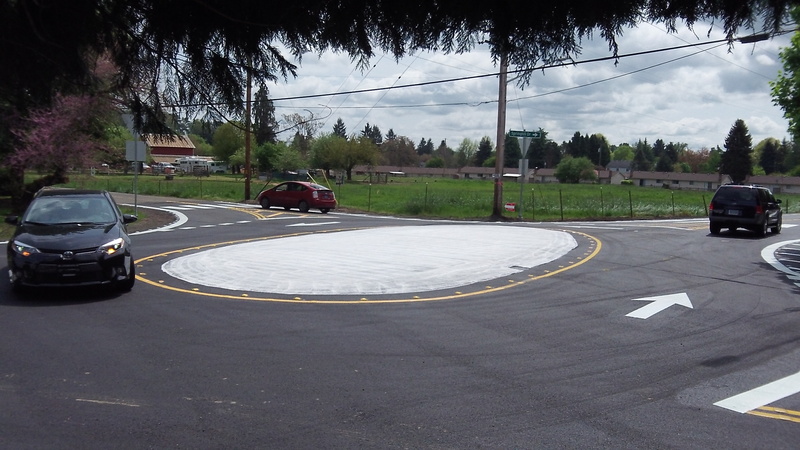 Engineer Chris Cerklewski announced the completion of the roundabout on Monday night. And on Tuesday afternoon, the city notified people that utility work that day was taking a little longer than expected but both lanes, up and down from Gibson Hill, would be reopened soon. Update: ODOT announced Wednesday it was making immediate changes to ease severe congestion due to lane restrictions at the south bypass and Highway 34 just east of Corvallis: Northbound travelers on the bypass will be allowed to only turn right onto eastbound OR 34. Going straight or turning west will not be allowed. ODOT created a dedicated right turn lane for northbound bypass travelers by reducing the construction area available to the contractor. This will allow eastbound travelers using the Van Buren Street Bridge to access OR 34 concurrently with bypass travelers. The combination should allow the intersection to function more efficiently. I’ve used it a few times with great ease. the key is for everybody to mind the 15mph limit.